Welcome to my Food Heaven! Want to know more about my love affair with food? So hop on my Food Safari and i will introduce you to the best of global cuisines with my personal twist. Your quest for delectable goodies and handsome photography will be satiated, indeed. I am truly not a dessert lover but its ironical that i always enjoy making them in my kitchen. I think its the feel of dessert making which makes me create a new one every time in my house. Desserts need to be prepared with extra love and care. They ought to be. The aromas and the goodness of sweets. Aaaah! So alluring!!! Today, i bring to you to a much awaited post. Its everyone's choice and love for all. You guessed it right, bang on! 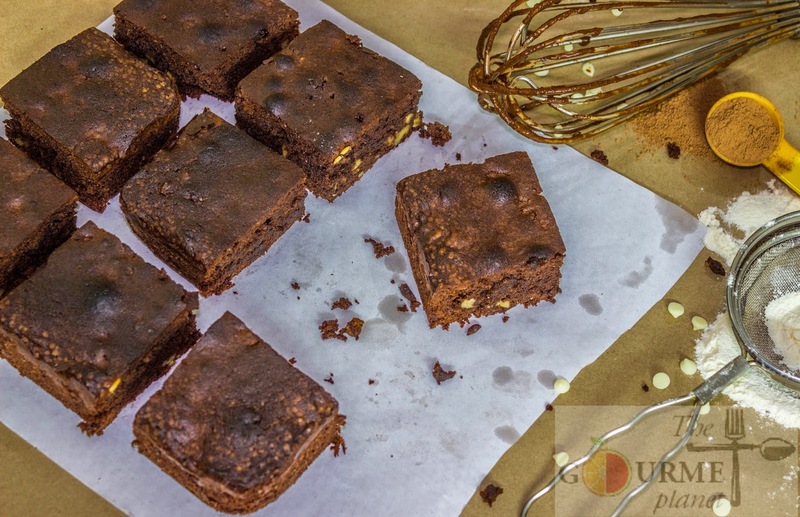 Classic Walnut Brownies...those extra gooey beauties with perfect chewiness are soo decadent. Absolutely IRRESISTIBLE! Well, it was a day before Christmas when i happened to meet a friend over a cup of coffee at Cafe Coffee Day. As always, a coffee has to be accompanied with a cake! So we called for those beautiful looking brownies showcased at the billing counter. They looked absolutely DIVINE! One bite and i was hooked onto them. I decided the next post for my blog. These gorgeous fudgy bites are loaded with walnuts and dark chocolate. Warm it up before serving and unravel the real happiness. 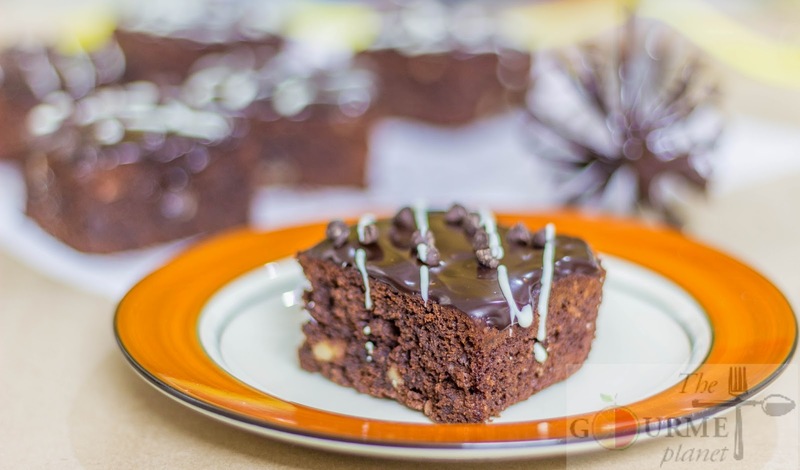 When everything appear dull & boring, lighten up your day with these sinful brownies and you will know how being in Food Heaven feels like. The recipe make 9 brownie squares of 2 inch each. 1. Line an 8 x 8 inch square pan with parchment paper all around the sides & bottom of the pan. 3. Preheat the oven to 180 degree Celsius. 4. Melt the butter in a pan or microwave and stir in the cocoa powder. 5. In a mixing bowl beat eggs, sugar and vanilla extract until light and frothy. 6. Further add the cocoa-butter mix and give a final blend. 7. Sift the flour into the mixture and fold in gently. 8. Add the chopped walnuts and transfer the brownie mix to the greased tin. NOTE: The brownie batter will be very thick and you will need a spatula to spread it well in the tin. Smoothen out the surface with the help of spatula to ensure its at the same level everywhere. 9. Bake in the center of the oven shelf for 30 mins and check with a tooth pick for the doneness. 10. Do not overbake and once done remove from the oven and cool the tin before cutting into pieces. 1. In a double broiler, melt the ingredients 'For Ganache' and ensure the mixture is lump free. 2. Let it cool for sometime. 1. Spoon out ganache and spread it evenly on the brownies and let it cool down further so that it hardens a bit. 3. Melt the white chocolate in microwave and whisk it till lump free. 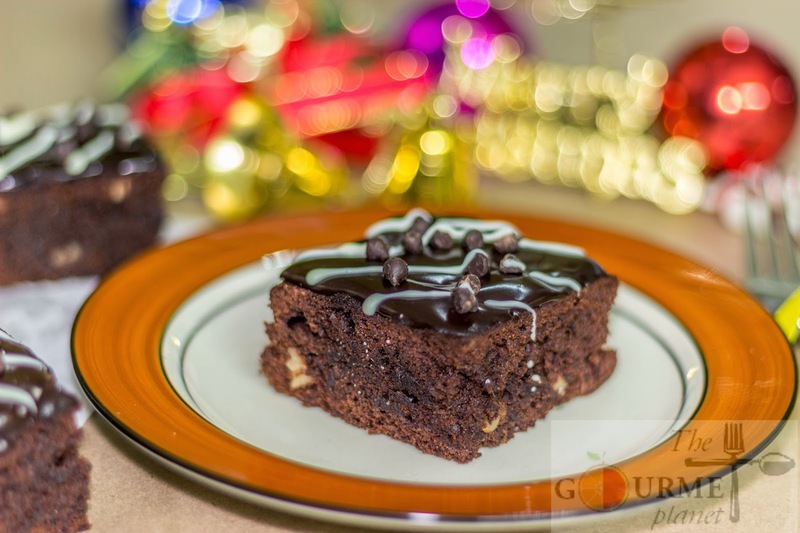 Warm the brownies a bit for few seconds in a microwave before serving and enjoy the chocoliciousness. Absolute death by chocolate indeed!! Fresh Fruit Cake...a pleasant Birthday surprise for your loved one! Chocolate Mousse Cake...a No Bake Delight! Corn & Spinach Canapes...a burst of flavors! Coconut Fudge Pops with Dulce De Leche Filling...Laddoos re-incarnated! Veg Hot & Sour Soup...Its Winter calling! The Gourmet Planet. Ethereal theme. Theme images by GelatoPlus. Powered by Blogger.